Spencer Victor Yorke de Horsey was born at Cowes, Isle of Wight, on 4 June 1863, son of Admiral Sir Algernon de Horsey, K.C.B. He joined the Navy as a Midshipman on 24 April 1879; Sub-Lieutenant, 24 April 1883; Lieutenant, 30 June 1886. He was Lieutenant in command of No. 52 torpedo-boat when it was run down and sunk in Argostoli Bay, Cephalonia, during night manoeuvres in October 1887, by a first-class boat of the attacking force, two men being drowned. As Senior Lieutenant of Archer he landed in command of a party for the protection of the British Legation at Söul during the war in Korea; was present when the Palace was taken and the King made prisoner by the Japanese forces in July and August 1894; with boats of Archer rescued, after two days’ search, the Captain and part of the crew of the Chinese cruiser Kuang Yi, destroyed to avoid capture in Prince Jerome Gulf. Received the thanks of the Chinese Government for this service. In January 1898, as Lieutenant-Commander in Plover off North Borneo, he served in two expeditions against Si Tali, a proscribed rebel, resulting in his stockade being taken, and himself and followers killed or captured. In August 1898 he received the thanks of the Colonial Office for services rendered while with the special commission for the newly acquired territory near Hong Kong. Commander of Monarch during the war in South Africa. Landed after Graspan to join the Naval Brigade; was present at the battle of Magersfontein and subsequent operations under Lord Roberts, including the taking of Pretoria, when he was severely wounded on 4 June 1900 (Twice mentioned in despatches, Queen’s medal with four clasps). De Horsey was specially promoted to Captain for services during the South African war (London Gazette 6 November 1900) and received a pension for wounds. De Horsey was appointed Captain of the second class cruiser Scylla in June 1902, and of the armoured cruiser Kent in December 1905. He was promoted to Rear-Admiral in November 1909, and was placed on the Retired List, at his own request, on 21 August 1911. 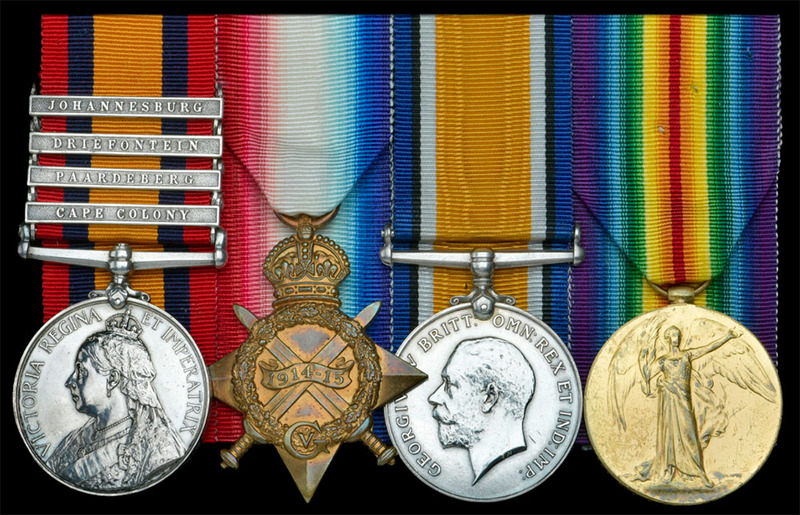 He was granted a temporary commission as a Captain in the Royal Naval Reserve on 14 November 1914. He was advanced to the rank of Vice-Admiral on the Retired List on 9 August 1915, and to the rank of Admiral on the Retired List on 1 January 1919. Admiral Spencer de Horsey died on 19 March 1937. Now they are on ebay…….